Have you ever thought you would like to be part of something and then said to yourself, What I was thinking? “Therefore, if anyone is in Christ, he is a new creation,” the Bible says. “Old things have passed away; behold, all things have become new”. When I received Jesus as a child, I became a new creation. I have been that “new creation” for about 51 years. But for countless years, I did not know what or how to be the person that my God created me to be. And I did not understand why I couldn’t be who I thought I should be or who I thought I ought to be. Then I learned that abuse can keep a person from understanding that they are created in God’s image. The abuse I suffered as a child, the abuse and betrayal I suffered as an adult, and some of my own choices had made it impossible to be who I thought God wanted me to be. Now I know it is important to see people and myself through my Savior’s eyes. This was a lesson I learned when Mr. B came into my life. At 27 months, “they” said he tested as a nine-month-old, and I was told that gap would likely never change. I can remember holding him in my arms, praying to God. I would say; “My Jesus, I want him to be who You created him to be. Please, Lord, I do not want what the world has done to him to be who he becomes. I just want him to be who You created him to be, no matter what that looks like. Slowly he began to talk. I taught him that I loved him and that he could trust me. I taught him that Jesus loved him. I taught him how to run to me when he was afraid or in pain instead of running from me. Today, instead of listening to the words of people who say that I try hard but I can’t do anything right...I have no talent...I am stupid—I could go on and on with this list but I will not—these days, at almost 65, I listen to what my Jesus says: I am loved, I am chosen; I am His bride; I can trust in MY Jesus when I am afraid (Psalms 56:3), and I am a new creation. I realize that being the creation my God intended me to be is a lifetime mission. As I take the hand of my Jesus and walk in who He has created me to be, I am beginning to see me as Jesus sees me. Just like Mr. B, I need to know that I can trust Jesus and that He loves me. I need to know that He wants me to talk to Him even if it starts with just a few words. Lastly, I need to run to my Jesus when I am hurt or in pain and allow Him to heal that hurt with His love. And when my journey is done here on earth and I enter into my Jesus’ arms, I will be a COMPLETE NEW CREATION. 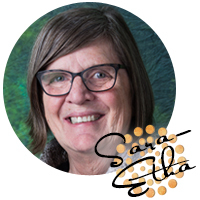 Sara has worked for Lane Community College for over 20 years and has been a member of CitySalt (SouthHills) Church from the very first service. She co-leads the Women’s 242 group that meets the 3rd Friday of every Month from September to June. She is a proud mother of 4 children and has 13 grandchildren who she dearly loves. Following a year of multiple health issues she created a “to-do” Celebration List because she feels blessed to be alive! This year she hopes to be able to cross parasailing off that list.